The sad truth is that disarming and defeating Silvio Berlusconi remains the country’s first priority. Rome—Italy’s general election on February 24-25 comes at a decisive moment for this country and for Europe. The neoliberal consensus that has powered Germany’s (and Europe’s) mean and miserly response to the 2008 depression seems to be faltering. Italians have a chance to make a real choice. To put it in a nutshell: Is the answer to our present economic and social ordeal more fiscal probity, or is it more social justice? On the side of probity, there’s the technocrat who was Italian prime minister until he resigned in late December, Mario Monti. Many Italians are grateful to Monti for stepping in to rescue Italy from near bankruptcy in November 2011. He intervened in a crisis gravely exacerbated by his predecessor Silvio Berlusconi, who was forced to sign a series of binding promises to the EU before leaving office. But now that Monti has himself entered the political fray to run for prime minister, it’s evident that his own conservative recipe is pretty close to what has been the EU line (yes, the one that has reduced Greeks to sawing down trees for wood to heat their homes and brought neo-Nazi protest groups like Golden Dawn to the fore). In short, the center left stands for modern European social democracy and Keynesian economic incentives. Bersani, secretary of the Democratic Party (PD), is sometimes accused of not being dynamic enough, but he defeated four other candidates in an energizing two-stage leadership primary in late November–early December. In round one he beat charismatic Nikki Vendola of Left Ecology Freedom (Sinistra Ecologia Libertà, or SEL), who has joined forces with the PD in this election, and in the run-off ran well ahead of the youthful mayor of Florence, Matteo Renzi, a PD reformer somewhat in the Tony Blair mold whom Italian business considered a far more appealing face for the center left. In late December a second round of primaries to select parliamentary candidates yielded quite a few new faces (and upsets for some longtime pols) and a field that is now a remarkable 40 percent women. In polls, the PD-SEL is far ahead of the field, with more than 35 percent. Okay, so there is a choice. Or there would be, if this country had not been drugged and made to attend a tawdry on-again, off-again performance of Don Giovanni for almost nineteen years. The consequences of Silvio Berlusconi’s long ascendancy—corruption, both material and cultural—run deep and are not easy to chase away. A titanic effort is needed to struggle out of the stage fog and the loud, cocky, seductive promises Italians have become used to, and make this election count. In the meantime, old Don Giovanni’s still seducing. Three months ago, it looked as if his political career was finished. Yet here he is, still in the running, if not officially for prime minister. His longtime allies in the right-wing separatist Northern League, desperate and losing ground after they, too, have been implicated in corruption scandals, reluctantly agreed to join forces with him once again, as long as he was not their candidate for premier. They want to exploit his residual charisma, that is, while assuring their own voters that he will never be in charge again. Residual charisma? Who knows what to call it? In a blast of TV appearances in January Berlusconi even appeared on a TV show that is home to one of his fiercest critics, journalist Marco Travaglio. At one point the two exchanged chairs, and when B returned to his own, he took out a handkerchief and theatrically dusted off the Travaglio cooties before sitting down again. It was a gag worthy of a 10-year-old, but Berlusconi’s ratings went up a couple of points after the show. A week later, however, a vicious battle was under way inside Berlusconi’s ranks about whether to offer sure seats in parliament to MPs involved in pending legal cases. Italian MPs are protected from prison sentences unless their fellow parliamentarians vote to lift their immunity—a get-out-of-jail-free card that has been much used by Berlusconi & Co. The PD recently cleared its lists of such questionable candidates; according to one estimate there were eighty such politicians in various parties in the last legislature. If not all of them are charged with serious offenses, Berlusconi’s backers include dozens who are, including charges of corruption and misuse of public funds and, worst of all, Mafia ties (B’s oldest friend, Senator Marcello Dell’Utri, and Campania strongman Nicola Cosentino, who stands to go to jail pending an investigation into connections to the Camorra, that region’s organized crime branch). In hopes of winning the crucial region of Lombardy, where the Northern League is still strong (and with it a controlling vote in the Senate), Berlusconi reluctantly sacrificed those two men. Berlusconi’s not the only spoiler, however. His corrupt, cynical rule has left a wide swath of the Italian electorate suspicious of politics altogether. Some will vote for former stand-up comedian Beppe Grillo’s Five Star Movement, or Movimento 5 Stelle, a protest group chasing votes all over the political map, from web enthusiasts to environmentalists to immigrant-bashers and neo-Fascists. Last year Grillo was polling 20 percent, but his backing has recently deflated to about half that. The PD primary (unique in Italy) had been so successful that Five Star held a primary too, on the web, but the turnout was minuscule and there were questions about whether the results were fixed. Former anti-Mafia prosecutor Antonio Ingroia may pick up some of those Grillo followers with his just-minted coalition Civic Revolution (RC), founded on December 29. Very much still evolving, the coalition includes four small parties: two from the hard left, the Greens and the remains of Italia dei Valori, a 20-year-old, vaguely left-of-center party, now discredited, that was started by another one-time prosecutor, Antonio Di Pietro. Civic Revolution’s profile is strongly anti-Monti and critical of neoliberalism, and seems to attract voters who trust Italy’s magistrates more than its politicians. But if RC does capture a projected 4-5 percent, it may crown its success by subtracting from the PD-SEL the margin of votes it needs to control the Senate. And that would play into the hands of Berlusconi, who along with the Northern League would then be able to impose a stalemate, blocking all legislation not to his liking. 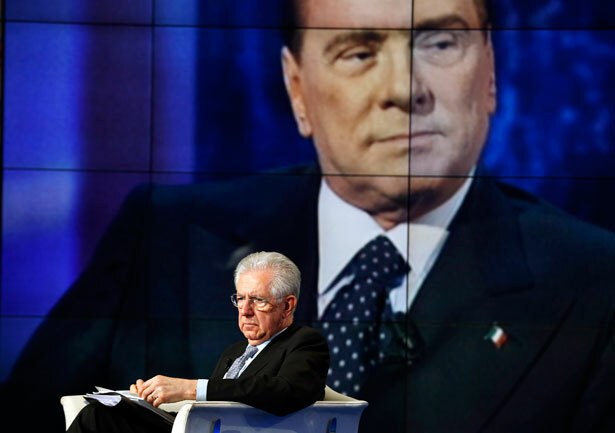 Paralyzing the upper house—easier than winning outright—seems to be Berlusconi’s current objective. Whew. Did I say this was the perfect opportunity for Italian voters to have their say on neoliberal austerity? Only if they can keep the issue in mind, of course. In a thoughtful recent article in the PD-aligned l’Unità, the veteran left militant Alfredo Reichlin argued that the debate was not about the specific measures in Monti’s program. “It’s not just financial matters at stake, but a question of how Italian society coheres.” How, that is, to emerge from “the crisis of a system based on debt and earnings from finance, which we are paying for by destroying jobs and family assets”? Does it make sense “merely to try to restart the consumer economy, or rather pursue another model of development…powered by significant government investments to make the leap toward a new, green economy that can keep pace with profoundly evolving world markets”? In such lean times, what kinds of EU cooperation or novel public-private accords are needed to help finance such a step forward? These are the kinds of questions the center-left would like to address, perhaps above all in Europe, where the political balance is likely to change after the German elections next fall. If only. But with the Great Seducer gaining in the polls, Monti and Bersani were rumored to have met to discuss how to keep him at bay. The sad truth is that disarming and defeating Berlusconi remains Italy’s first priority, and before change can be addressed a whole slew of laws need to be passed or repealed in order to repair the damage he has done. A new electoral law, a conflict-of-interest rule and laws to re-penalize false balance sheets and stiffen anti–money laundering measures are just some of those. Although Monti and Bersani represent opposite sides in the great debate of our times, they will almost certainly have to work together after the elections. There’s nothing conspiratorial about it; these are the ruins Berlusconi has left behind him. Madamina, il catalogo è questo, says Leporello of Don Giovanni’s conquests: Lady, that’s how it is. Progressive politics in Greece are also in the lurch. Read the editors’ take in this week’s issue of The Nation.